Shmarya Rosenberg has been published in Newsweek/The Daily Beast, Moment Magazine, the Forward, Tablet, StarTribune, Jewcy, Sh'ma and Heeb, and was profiled in the New York Times, Ha'aretz and the Jerusalem Post. His work has been cited in dozens of newspapers and broadcast media sources worldwide, including the Wall Street Journal, New York Times, New York Daily News, New York Post, New York Observer, AP, Des Moines Register, Ha'aretz, Jerusalem Post, and CNN and CNBC's America Greed. He is the publisher and editor of FailedMessiah.com. Neturei Karta and for that matter also the Satmar Hasidic sect believe that only the Messiah can create the state of Israel and therefore they are against the current state of Israel. To this end they resemble Pagans more then Jewish people because they strive to destroy the state of Israel and create anarchy and destruction and from this they believe the Messiah will come. The Messiah certainly did not come when they were in the gas chambers in Nazi concentration camp so why wait for him? Their argument is really idiotic considering that nowhere does is say that Jew can’t have their own government or help in their defend and way of life. God can help but he does not prevent us from defending ourselves. The Messiah can come and he will do whatever he wants. 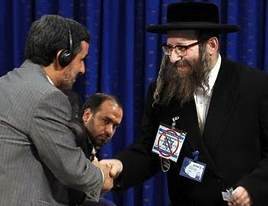 Therefore such people as Neturei Karta and Satmar team up against Israel with any enemy of the Jews in hope for the destruction of the state of Israel. Did I say Pagans already? I think that Haredim must be horrible people. Oh, wait a minute–I AM Haredi! But I’m not a horrible person. Well Mendy, no one said all haredim are horrible, so you attacking a straw man while crying victim, which plays into haredi stereotypes. And I know you don’t want to do that, right? If Heeb wants to print Rosenberg’s “Crooks and Schnooks” drivel, they should start with an article Rosenberg recently wrote for Tablet Magazine, in which he claims, that in the early 1990’s, actually plotted to assassinate Yitzchak Rabin, cased Rabin’s residence, and then when Rabin was actually murdered, was upset that Shimon Peres wasn’t assassinated along with him. Since then he claims he’s “reformed.” He’s gone from plotting physical assassination to merely carrying out character assasination. Morris, could you please just STFU already? No one wants to hear it any more. We all get it – you don’t like Shmarya. Over and over again, like a broken record – we’re sick to death of it already. You’re a deeply disturbed and obsessive man. Get help. In the meantime, go into your room and scream into a pillow, but keep it to yourself.